Brillantmont was founded in 1882 as a boarding school for girls. Now, 131 years later, many things have changed, but members of that same founding family still own the school and sit on the School Board, heading a team which steers students towards academic and personal success. Founded in 1882, the school’s location changed within a few years from the rural setting of Lutry to the more urban one of the beautiful city of Lausanne. Brillantmont embraced its change of location and now makes good use of its proximity to Lausanne’s bustling city centre, while still making the most of stunning views of the Alps and Lake Geneva. Originally open only to young ladies, Brillantmont’s day school became co-educational in 1968 followed by the opening of the boarding school to both boys and girls in 1992. A change to the curriculum in the 1940s saw a move from a French focused programme to the American and British programmes used today, offering students a High School Graduation Diploma or Cambridge International Examinations in IGCSE/ AS and A Level. The establishment of a Middle School in 2011 has enabled the school to open its doors to children as young as 11. However, despite growing numbers – the boarding school now numbers around 100 students and the day school 60 – the school remains committed to small class sizes and low student-to-teacher ratios, which help it maintain high standards of teaching and learning. Those high standards are reflected in Brillantmont having successfully met the criteria for accreditation by the European Council of International Schools for numerous years. 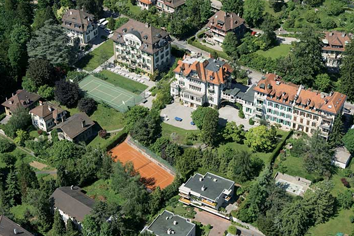 In 2007, the school also became a founding member of the prestigious Swiss Learning Association that brings together Switzerland’s top international boarding schools. Most recently, the school has focused on developing technology such as wireless internet and an intranet for its community and on building modern facilities while remaining true to its historic and picturesque surroundings. Chief among these developments is the new sports and performance hall opened in 2012, which has been built underground to preserve the view above and to maximise space. This combination of valuing heritage and embracing the future has seen Brillantmont continuously evolve during its years of establishment, and will see it continue to thrive in years to come.